Quench your clients' thirst for summery nail art. 1. In opposite corners, create two semi-transparent circles, one in yellow gel-polish (Vetro 242) and one in green gel-polish (Vetro 243). Cure. 2. Use a thin liner brush to outline the corresponding circles with pastel yellow (142) and pastel green (112). Cure. 3. Add another pastel yellow outline and paint a second darker green outline (Vetro Gel 24). 4. 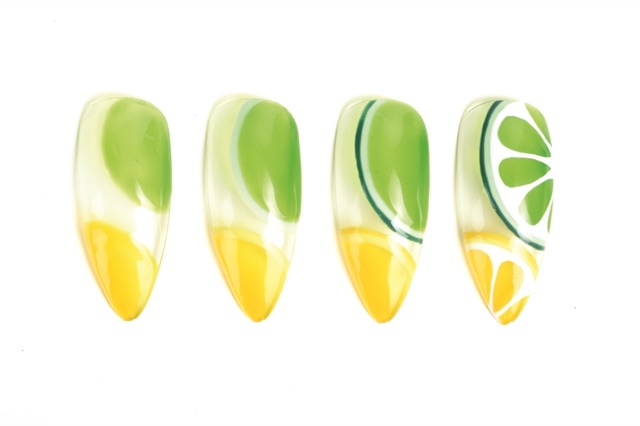 Using Presto’s White Art Gel Liner, create a string of teardrop shapes on the inside of both the lemon and lime. Fill in the surrounding space with white, leaving the teardrop shapes the transparent green/yellow. Apply top coat and cure.